I decided to share some of my thoughts on this with you in an article because it always helps me to get clarity on the whole process. admiring my paintings asked me – where do you get the templates from? That really made me smile. What a lovely question. I began to explain to him that I never really know what the paintings are going to look like when I start them. The quicker I get out of my own way and allow everything to flow, the better. That’s when the magic starts. Many of you will know that I stretch my silk onto the frame, mark the centre and then draw several random concentric circles with a fabric marker and compasses. I then take my bottle of gold gutta, the resist that creates the pattern, and start to draw the pattern, circle by circle, going out from the centre. I allow it all to unfold freehand, so the mandalas have a natural, easy symmetry without being too exact. one hour at a time. I normally play some of my favourite spiritual music and then completely surrrender to what is happening. There have been times that I have stood back and said – oh, wow, that’s what you look like. It’s only when I stand back and put down my tools that I get the bigger picture. And to the question of my having a lot of patience to do this kind of artwork, well, it’s all about being in the present moment, the extended now when I paint. Then linear time ceases to exist. It’s a moment and an eternity in one. These photos here show “Stargate” being created. I painted it in the summer months and so was able to have the patio doors open to let the warm air in to circulate in the room. I lost count of how long this painting was actually on the frame. At the end of the day it doesn’t really matter. It was a pure joy to paint. 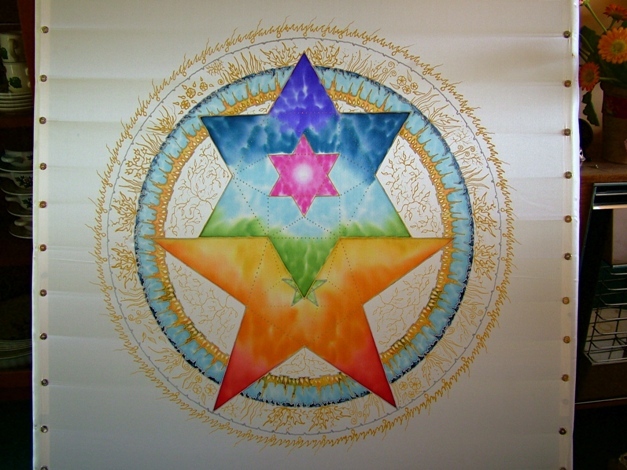 The chakra colours run up through the two stars with high-vibrational magenta in the centre. But one thing is very clear. Painting in this way is a nourishment for the soul. Colour is pure energy. And energy allowed completely free flow is a potent form of healing. So healing the world with these beautiful colours seems a very worth while way to be. 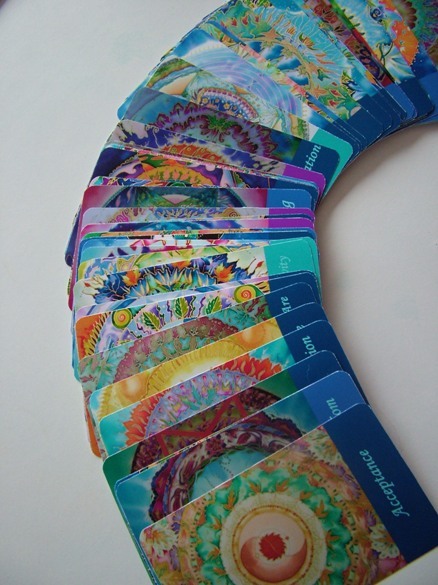 This entry was posted in INSPIRATIONS and tagged chakra, COLOURS, Fiona Stolze, healing, mandala, meditation, nourishment, painting, silk, soul, stargate, templates. Bookmark the permalink. I’m glad you asked because this will provide information for others who surely want to know the same. Mandala is Sanskrit word which means mystical circle. There are many examples of mandalas all over the globe in all religions and belief systems, some of which are probably very familiar to you. The Buddhist mandalas representing their deities and Christian rose windows are two examples of this. 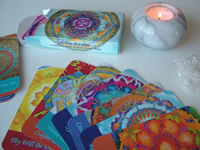 And today mandalas are used as a focus for meditation and stilling the mind. They are even used by therapists for drawing out issues that clients are unable to put into words. 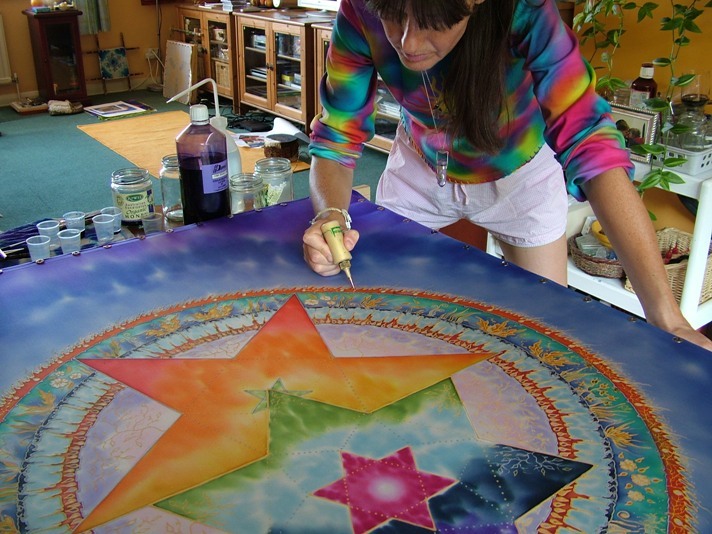 By drawing their own mandala images, the subconscious issues are brought to daylight.